Eschenbräu - original Wedding Beer brew art. We serve fresh draught beer! Schraders - the cult bar in Wedding. - No matter if for a cocktail in the evening or for brunch at the weekend. La Luz – the event venue next door. Party in the La Luz & stay overnight in the Steps Hotel in Berlin. Round and round. 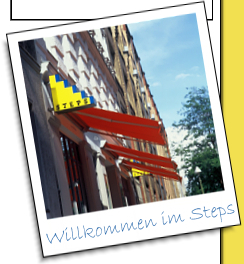 © 2009-2019 Steps-Hotel / Berlin. All rights reserved.